Fundraising for the proposed renovations to Columbus Square Park is in full swing! The fundraising committee has made great progress and is close to meeting its fundraising goals. 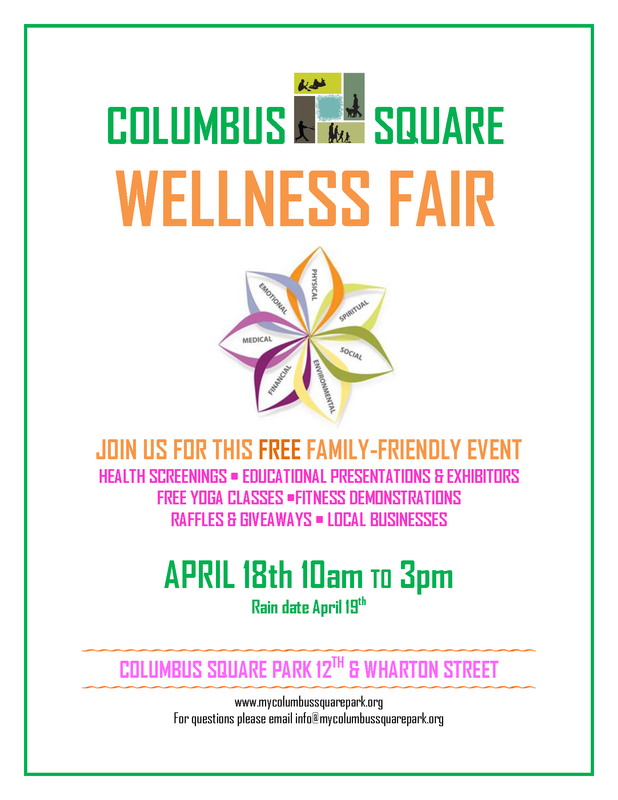 A variety of fun, family-friendly, community building events are planned for this spring, including a Health Fair on Saturday, April 18, a Columbus Square Park reunion on Saturday, May 9 and a dog-centered fundraiser on Sunday, May 17. Details are available on the Columbus Square Park website or by calling (215) 685-1890. Get engaged! 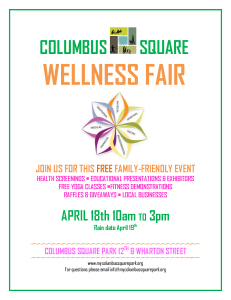 On April 18 Columbus Square is hosting a Wellness Fair from 10am to 3pm! See the flyer at left for details. And check out MyColumbusSquarePark.org for more upcoming events at Columbus Square Park – like the Green Club meeting on April 29 for community-minded gardeners! And for dogs and their best friends – the South Philadelphia Association of Dog Owners is proud to announce that on Sunday May 17, from 9 am to 4 pm, the whole of Philadelphia’s dog owning population will gather together for a day of information, education, services and camaraderie. There will be plenty of room to run inside Columbus Square’s city-block-sized-fenced-in-field. Along with a day of fun with our furry friends, vendors will offer the entire gamut of K-9 amenities including pet adoption, veterinary services, retail needs, toys, treats, professional walkers and trainers. Admission will cost $5 in advance and $10 at the gate; all proceeds will go directly towards the revitalization of Columbus Square and its dog run. Please contact Southphillydogs@gmail.com with any questions.